The Federal Reserve meets this week. Traders believe it will raise short-term interest rates. Higher rates slow economic growth, and the Fed believes it needs to slow growth. 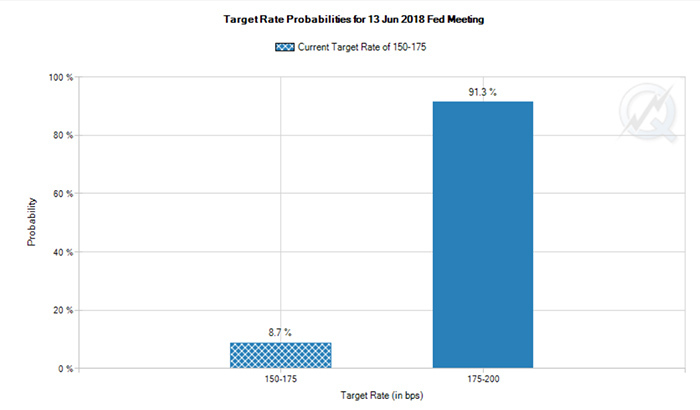 Heading into the meeting, traders in futures markets are pricing in a 91.3% probability of a rate increase. Right now, the Fed’s target for the fed funds rate, its benchmark interest rate, is 1.5% to 1.75%. Traders expect that rate to rise to 1.75% to 2% on Wednesday, June 13. This probability comes from the prices traders pay for futures on fed funds. The federal funds rate is the rate banks borrow from each other at. Banks are required to hold a certain amount of their deposits in reserve. This is like having cash in the vault. If a bank has too much cash in the vault, they are passing up a chance to maximize profits. If they have too little cash in the vault, they violate Federal Reserve rules. The Fed looks at reserves every day and acts against banks with too little cash in the vault. Typically, some banks come up short at the end of the day. To make up the shortfall, they borrow from other banks. These are called fed funds loans. The Fed targets this rate to increase or decrease the amount of money in circulation. By raising the rate, the Fed hopes to slow economic growth. That should slow the pace of inflation. If inflation does not slow, the Fed will raise rates again and again until inflation falls to where it wants it. For now, the Fed is expected to push the fed funds rate above 2% by the end of the year. But the Fed follows the market. When probability of a hike is 90% or more according to futures traders, the Fed always accommodates the market. Not doing so would set off a market crash. So, it’s really the traders in the futures market setting the rate. To understand the Fed, I’m watching traders. If they get worried about inflation, the Fed will act quickly. And that could create a steep recession. So far, traders are happy, and that means the Fed is too. Editor’s Note: On June 12 at 1 p.m. EDT, renowned investor Paul Mampilly will be going live with a landmark broadcast … revealing the exact method he has used for close to 20 years to grab some of the biggest, fastest gains of his career. During this FREE online event, Paul will show you how to begin harnessing this method immediately to begin booking rapid-fire profits, like the total gains of 3,485% Paul racked up in less than 90 days. However, the invitation to join Paul for this event will only be up for a brief time, and you must be signed up by tonight, June 11, at midnight EDT to attend. So don’t wait! Click here now for complete details.